Pulleys are very useful when we want to transfer energy from one place (or device) to another. For example from a wind or watermill etc. to an electrical generator. 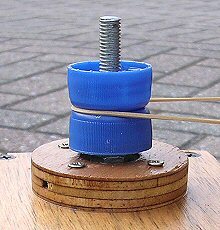 Described here are some very simple homemade pulleys that can be made from bottle tops and scraps of wood. These simple pulleys have been made from two bottle tops fitted back-to-back on a threaded metal shaft. The two tops are carefully drilled in their centers then two washers and two nuts secure the tops in place from either side. 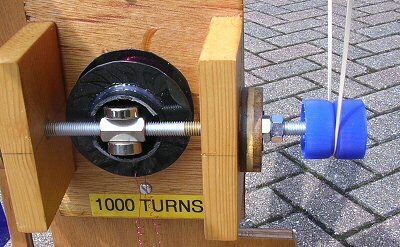 To make one pully: Cut three circular discs of wood from plywood: two large and one slightly smaller. Use a compass to mark them out. Once cut-out drill a small (ca. 2mm) hole through the center of each disc. Make a sandwich with the smallest contained within the two larger discs and glue them together using wood glue - a nail put through the three center holes will align the discs properly. Cut out a piece of fine sandpaper the width and circumference of the small disc. Glue the sandpaper to the central disc (use thin nails to secure the two ends of the sandpaper). Repeat the process to make another pully of a different size suitable for the drive-speed ratio you require. For example if you are powering a generator from a high speed watermill (e.g. a Pelton wheel) then you might want a small pulley on the mill and use it to drive a larger pulley on the generator. If you are using a relatively slow wind mill you might want to reverse this pulley arrangement. Obviously you need to consider how you will attach the pulleys to the two systems and this will rather depend on your particular set-up. Pulleys with a slightly smaller size hole than shaft can be hammered in place to give a tight fit. If a hole can be drilled through the shaft then a bolt can be put through and used as an extra anchour to the pulley so that it wont slip. Once attached the two pulleys are connected with a drive band. This can be made from a thin piece of leather (cut from an old belt), a piece of bungy, elastic cord or even a rubber band. The sandpaper on the pulleys increase friction and help to stop the belt slipping. If you can move one of the pulleys away from the other to get tension in the system it will help. You can use a spring to apply a little tension and it will improve performance a great deal. This can be done by incorporating the spring into the ends of the drive band or by using the spring to pull one of the pulleys away from the other. A large pulley was mounted to the windmill which drove a smaller pulley on the electrical generator. The size and ratio of the pulleys were chosen so that the generator did not stop the windmill from turning under normal wind conditions.